This is an exciting new approach to the sign business with your success in mind. It is a business-to-business partnership between Signs4Success and any business with recurring signage needs. or anyone interested in a powerful tool for managing an inventory of signs in the field. This unique system frees your resources so you can focus on your customers. 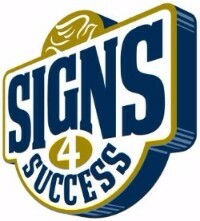 Contact us today to learn more about what the Signs4Success Sign Management System can do for you!